Professor Carmelo Mesa-Lago recently published a provocative article entitled “Is it viable to end half a century of rationing in Cuba?”1 This is an important question: the current rationing system in Cuba is widely regarded as a major source of distortions, and its elimination is singled out as a key priority in several proposals to reform the island’s economy.2 The rationing system also has been criticized within the Cuban administration. For example, Central Bank President Francisco Soberón is quoted by Mesa- Lago as calling the current system “catastrophic for the country’s economy and ethically unacceptable.” Professor Mesa-Lago’s pessimistic conclusion regarding the possibility of ending rationing is therefore a source of concern and requires a thorough evaluation. This paper analyzes briefly Cuba’s rationing system, which is part of a broader system of price controls, subsidies and trade restrictions, but which coexists with markets where certain goods can be purchased without rationing. The paper examines the detrimental effects of the system on the economy, evaluates strategies for reform, and concludes that Professor Mesa-Lago’s pessimistic conclusions are unwarranted and that it could and should be possible to abolish rationing without damaging consequences for poverty or financial stability. Cuba’s rationing system was introduced in 1962 to ensure a minimum supply of “essential” goods to every member of the population at affordable prices. It works by restricting sales of products to the public to amounts specified in the “rationing book” (or libreta), while setting prices well below market-clearing levels. The scheme thus involves a redistribution from the general population (including the “rich”) to the “poor,” as intended, but at the cost of a dead-weight loss. It generates an excess demand for goods at the controlled prices, and therefore leads to shortages and queues and reduces output and employment. It provides incentives to buy rationed goods at controlled prices and resell them in the black market, an operation that generates employment and earnings but involves costs (e.g., waiting in line) and the risk of being caught. It also gives rise to an excess supply of money that burdens the population (with “forced saving”) and hinders the development of financial markets. And it is associated with a fall in the effective supply of labor3 as it weakens incentives to work. These spill-over effects are examined more formally in the Annex to this paper. Rationing in Cuba is part of a broader system of price controls that extends far beyond the area of consumer goods included in the libreta and affects markets for intermediate goods, industrial supplies, and agricultural products. In this way, the system creates widespread distortions throughout the economy. It can also favor certain sectors and discriminate against others on the basis of political preferences and bureaucratic whims.4 The issue confronting policymakers, therefore, is not just to abolish the libreta but to eliminate the entire system of price controls. Price subsidies are an important part of the system. The prices of many commodities (domestically produced or imported, including notably petroleum products) have been and continue to be heavily subsidized at tax-payers’ expense—Russian, Cuban or Venezuelan taxpayers, depending on the period. The effect of these subsidies is to lower the equilibrium price of goods below would it what it would have been otherwise. However, some prices are regulated at levels even below subsidized levels, so that excess demand may prevail even in the presence of subsidies. Throughout its history, the rationing system has coexisted with markets where goods were available at more or less free prices. First, the shortages associated with price controls have always been alleviated (but never eliminated) by black markets. Second, in certain periods, the effects of rationing were attenuated by policies that allowed free access to a number of products for some members of the population. This was notably the case after the reforms of 1993–94 when Cubans were allowed to receive U.S. dollar remittances from abroad and to spend the proceeds in special stores (the so-called “foreign exchange recovery stores” or shoping), thus obtaining goods unavailable in state stores, albeit at higher pricesand payable in U.S. dollars. At the same time, farmers were allowed to sell some products in free agricultural markets and, beginning in 1994 the self-employment sector was allowed to supply a limited number of services at unregulated prices. These measures of liberalization were weakened in the late 1990’s and largely reversed in 2005. As shown by Mesa-Lago, the Cuban government has had a tendency to tighten the system over time by reducing the rationing quotas, and the gap between free market and regulated prices has shown a tendency to widen over time. CAN RATIONING AND PRICE CONTROLS BE ELIMINATED? It is generally recognized that the elimination of price controls will improve the functioning of the economy through a more rational allocation of resources. It would increase output and employment, eliminate the time wasted in queues and the aggravation caused by power and water outages, and improve consumer welfare by expanding the availability, variety and quality of goods. The end of rationing, particularly if coupled with the elimination of accompanying subsidies, would also put an end to the implicit subsidization of the “rich,” and would also eliminate the activities of black markteers. Thus, decontrol is clearly desirable on both efficiency and ethical grounds. Two questions remain, however. 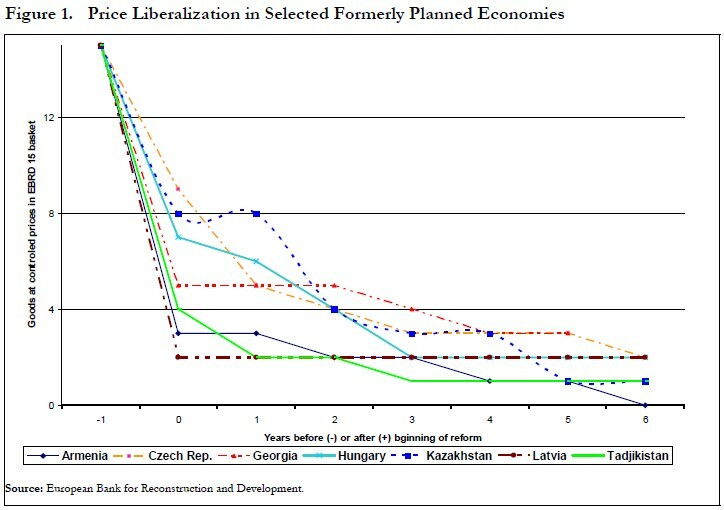 First, is price liberalization (including the elimination of the libreta) feasible? The answer appears to be a clear and simple yes. The former communist countries in central and Eastern Europe and the former Soviet Union have succeeded in virtually eliminating pervasive price control systems that had lasted up to 80 years, and most of them achieved this in basically a few years (see Figure 1). There is no reason why Cuba cannot do the same. Second, can decontrol be coupled with measures that protect the poorest segments of the population from sharp increases in the prices of “essential” goods, and can this be done without derailing Cuba’s fiscal position? These questions are examined in the remaining sections. Professor Mesa-Lago’s first strategy is said to be the “most logical,” but it is really the most mysterious: “to end rationing by increasing the supply of consumer goods by raising domestic production or imports.” How production and imports are to be raised is not explained, but it is said that the strategy is not viable while the current economic policy of the Cuban government persists. Presumably this means that this strategy would require a sustained period of high growth and that this is unlikely to occur under current policies. It would require a more fundamental reform of the economy which presumably would involve the elimination of price controls (since they are a major obstacle to growth), and at the same time would be a prerequisite to end rationing. We are chasing our tails. There is, in my view, a more interesting and logical version of this strategy. If policies were allowed to change, price decontrol and the end of rationing would be accompanied by trade liberalization and by enterprise privatization and reform. Together these changes would help to increase the supply of goods and moderate the price increases resulting from decontrol. Of course, this is not to say that price decontrol on its own should not be attempted before a comprehensive reform program is adopted. “Abolish the rationing system (including the libreta) but maintain the existing price subsidies.” According to Mesa-Lago, this proposal would “generate chaos because people would abandon their jobs to chase the food products, thus generating queues longer than those under the revolution.” In fact, there would be no queues and no rush to buy any goods. Since the end of rationing would mean the end of price controls and rationing quotas, prices would clear the market and there would be no shortages. At the same time, subsidies would keep prices lower than they otherwise would be, helping the poor to cope with the abolition of the libreta, but continuing the subsidization of the “rich” by the state. But the fundamental problem with this “strategy” is that Cuba cannot afford the fiscal cost of maintaining subsidies indefinitely unless the Venezuelan government (or some other foreign Good Samaritan) is willing to provide the required assistance indefinitely. The government “could abolish the rationing system and allow prices to be determined by supply and demand,” and “let those who have the money buy the existing supply at very high prices.” Under this proposal the rationing system would be dismantled and therefore prices would be freely determined by supply and demand, like in proposal 2, but price subsidies would be eliminated. Thus, prices could increase sharply relative to both the status quo ante and proposal 2, with adverse effects on the poor. The point, however, is that price decontrol does not have to be taken without compensatory distributional measures, which leads us to Mesa Lago’s fourth proposal. The elimination of rationing “could be combined with an increase in social assistance to the poor and to low-income groups.” Mesa-Lago notes that the Cuban government appears to have taken this route in 2005 by raising state sector salaries, pensions and levels of social assistance. Actually this might not have been a bad idea had it been accompanied by price liberalization and other measures to expand domestic production. Together these measures would have helped to cushion the effects of decontrol on the poor while moderating the fiscal and balance of payments effects of the rise in aggregate demand.5 But to resolve the problem in this way, says Mesa-Lago, would be very costly and “would generate major financial instability.” That remains to be seen. The fifth and final strategy is to “restrict rationing to the poor and to low-income groups and allow the rest of the population to buy the goods at prices determined by supply and demand, with complementary purchases in free agricultural markets and shoping.” Under this strategy, prices would be allowed to fluctuate freely in all markets except those reserved to the poor. But then there would be no reason to “allow complementary purchases in shoping” as prices in free markets and shoping would be arbitraged. In any event, this strategy would call for the de-criminalization of the use of the dollar (undoing the re-criminalization of 2005), the re-establishment of free agricultural markets, and price decontrol for the bulk of the population. In terms of efficiency, this would be a notable improvement compared to the present situation. It would also end the subsidization of the “rich” through the rationing system, an important ethical question. However, as shown in the Annex, the same result could be obtained more efficiently along the lines of proposal 4, i.e., by eliminating rationing and compensating the poor (and possibly those who do not receive dollar remittances) through budgetary transfers. Mesa-Lago adds that compensation would require an “even higher’ increase in state salaries (quite possibly) with the harmful budgetary and financial effects noted under strategy 4 (not really). He concludes by quoting President Fidel Castro as estimating that the elimination of rationing would cost 600 million pesos. To deal with the social consequences of price decontrol may be “costly”—that’s in the nature of things after five decades of command economy. But it need not generate “major financial instability.” This is shown in the short-term budgetary projections contained in the “Summary of Economic Policy Recommendations.” 6 These projections envisage not only full price liberalization but also a depreciation of the peso, and propose economic reforms that go well beyond the elimination of rationing. Yet, the plan can be financed through compensatory fiscal measures without increasing the fiscal deficit. On the spending side, the proposals envisage a 15% increase in public sector wages (costing the equivalent of 4.9% of GDP), an increase in pensions (1% of GDP), a rise in social outlays (1% of GDP), and the creation of an unemployment insurance system (2% of GDP), for a total of 11% of GDP. Almost one third of this increase in spending would be offset by the elimination of subsidies associated with price differences and subsidies to products (3.5% of GDP). The rest would be taken care of by an increase in import duties, a continued reduction in subsidies for enterprise losses, and a cut in some categories of (non-social) expenditure. The combined result of these measures would be approximately deficit neutral, so there would be no pressure on aggregate demand and no need to resort to foreign resources or to inflationary financing. In conclusion, the complete liberalization of prices and the abolition of the rationing system would eliminate a major source of distortion from the Cuban economy, expand the supply of goods and put an end to queues and outages. It would also allow the elimination of price subsidies, thus helping to provide the resources needed to compensate the poor, and reducing Cuba’s dependence on unreliable foreign governments and on the vagaries of the international price of oil. These actions would foster a strong expansion of output and employment, particularly if they are reinforced by other policies of economic liberalization. Indeed, price decontrol accompanied by tough but feasible social safety net measures could improve the welfare of all members of the population without hurting the poor and without generating significant financial imbalances. The rationing system can and should be abolished. Those who claim otherwise are taking council from their fears. Consider for simplicity an economy consisting of a state enterprise sector producing a single good without subsidy. Figure 2a shows the equilibrium between aggregate supply and aggregate demand for goods in the absence of price controls, with price p* and production q*. The introduction of a price ceiling at p0 leads to a fall in production from q* to q0, creating an excess demand for goods equal to the horizontal distance between the demand and the supply curves at the level p0 (double pointed arrow). The horizontally shaded rectangle represents the effect of the lower prices of goods under the rationing quotas, and the grey rectangle represents the welfare loss of consumers who are prevented by the rationing quotas from purchasing more goods at higher market prices. Figure 2b shows the economy’s production function, and it indicates a fall in effective employment (from n* to n0) corresponding to the decline in output. Figure. 2c shows the labor market, which clears at a real wage rate of w* and a level of employment n*. When the price control is imposed, output and effective employment fall to q0 and n0, respectively, while the real wage declines from w* to w0. The lower labor input can take the form of open unemployment (although the government generally has been reluctant to accept this outcome)7 or it can take the form of absenteeism or goofing off on the job. Figure 2d shows the money market. Given the nominal supply of money (m, exogenously determined by the authorities) and the upward sloping demand for money schedule, the money market clears at a price p* and a level of national income q*. Setting the price level at p0 gives rise to an excess supply of money (overhang) equal to the horizontal distance between the money supply and demand at the regulated price (double sided arrow). The emergence of a black market in goods involves illegal enterprises or individuals buying rationed goods at p0 and selling them at a higher price, subject to the risk of being apprehended and punished. The black market price would rise to somewhere around pb, where some of the excess demand would be satisfied and the gap between free and actual (average) price has narrowed. The case of a subsidy is illustrated in Figure 3. In the absence of rationing, the subsidy will shift the supply curve to the right, lowering the market-clearing price to ps*, and increases production from q* to qs*. The rectangle with vertical side p*-ps* represents a redistribution from the tax-payer or the foreign donor to the general population (including the poor). The rectangle with base q*-qs represents increased absorption corresponding to subsidized production. Anecdotal evidence suggests that that subsidized goods in Cuba are often rationed and subject to excess demand. This case is illustrated in Figure 3 by setting the price level at p0 (or anywhere below ps*) which leads to a cutback in production to (or even below) its original level q0. 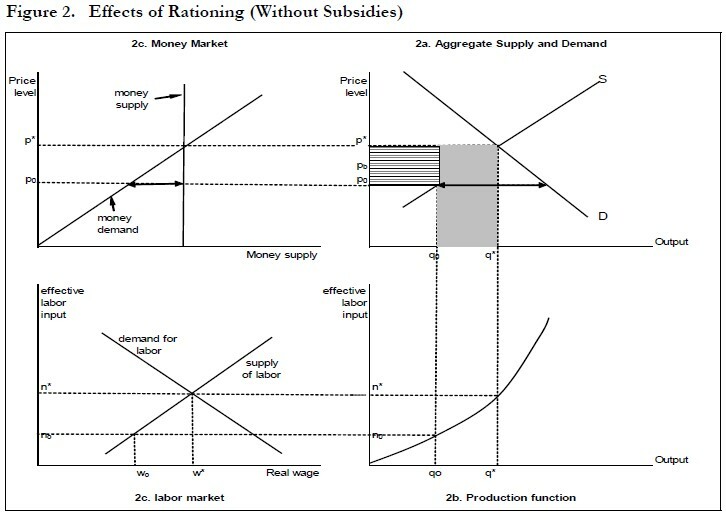 Figure 4 compares the effects of rationing (point B, with price controlled at p0 and production at q0) with the effects of price liberalization accompanied by a tax increase (and/or a reduction in budgetary subsidies) coupled with a fiscal transfer to the poor. It is assumed that the combination of expenditure and revenue measures is designed to be deficit neutral, so that its net effect on the demand schedule is zero. This fiscal package coupled with price liberalization results in market equilibrium at point A. The horizontally shaded rectangle disappears and is replaced by a transfer from the general tax payer to the “poor.” And there is an increase in absorption at higher prices (diagonally shaded rectangle) as output and employment rise to the levels that would prevail with fully liberalized prices but without fiscal action (q*). 1. ¿Es viable terminar con medio siglo de racionamiento en Cuba?,” Revista Vitral, No. 74 (Julio-Agosto de 2006). Translations from Spanish in this paper are the author’s. 2. See, for example, Jorge Sanguinetty, Ernesto Hernández-Catá, Armando Linde, Matías Travieso-Díaz, Antonio Gayoso, and Joaquín Pujol, “Summary of Economic Policy Recommendations for Submission to the Council of Ministers of Cuba.” Power Point document presented at a conference in Georgetown University, Washington, D.C., October 2006. 3. In this paper, the term “effective supply of labor” or “effective labor input” refers to man-hours worked adjusted for the intensity of work effort—a theoretical concept with no empirical counterpart. 4. This has been notably the case in the agricultural sector where cooperatives (including the Basic Units of Cooperative Production, or UBPCs, created after 1993) often saw their profits squeezed by low output prices and high input prices set by the authorities. These cooperatives experienced annual losses that peaked at just over 700 million pesos in 1997 and had to be offset by transfers from the budget. These subsidies were phased out after 2001. 5. In the event, as noted by Mesa-Lago, the policy contributed to a large increase in the fiscal deficit and a surge in imports in 2005. What was missing from the plan was a set of measures to offset the impact of higher expenditure on the fiscal deficit. More on this below. 6. See Sanguinetty, et.al, Table 2. 7. Employment in the state sector did fall considerably from 1991 to 1995, but this was partly offset by a rise in private employment following the liberalization measures adopted in 1993–94.